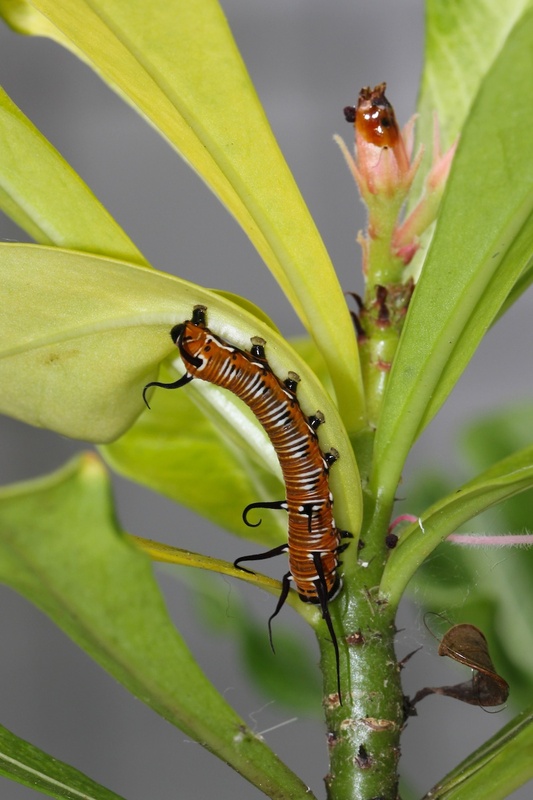 Our Wet season is the ideal time for caterpillars since that is when their food plants are growing best, so it makes sense that the Wet is also peak butterfly mating and egg-laying time. In the last week or so I have seen lots of Migrants, Eggflies and Crows and observed both mating and egg-laying; I have also seen a few Hawk-moths and know they have been similarly busy. 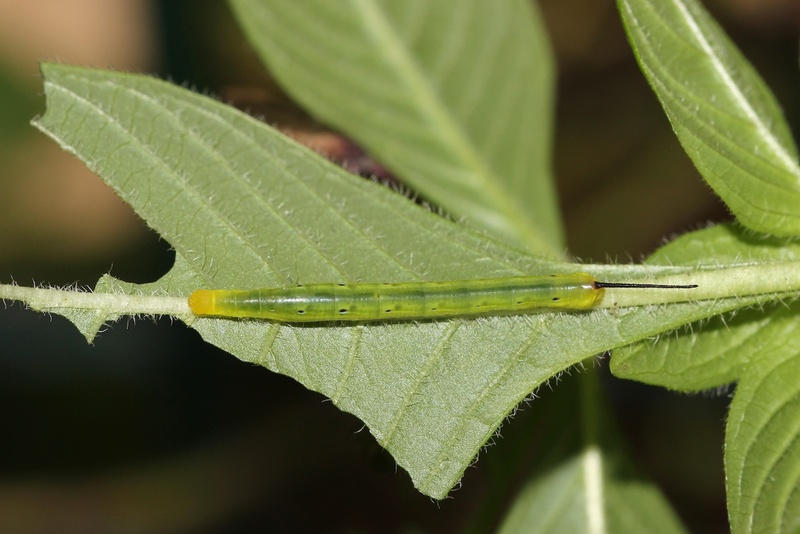 Here are two caterpillar stories from the last few days. Common Crow, Euploea core, on snakeweed (an exotic pest species, but the butterflies love it) on Cape Pallarenda. 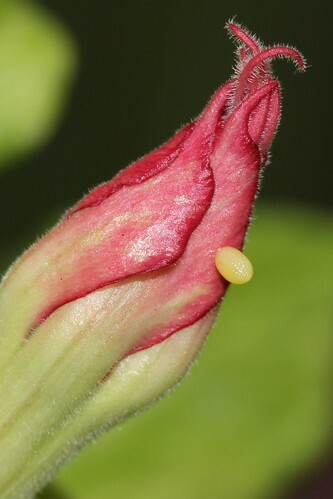 The egg is about 1.5 x 1 mm and a close-up of it is here. What will happen to it when the flower opens, I wonder? Hawk-moths are quite large and heavily built and so are their caterpillars but this is a very young one, about as thick as a toothpick and two-thirds as long. The tail-spine and the eye-spots are characteristic. 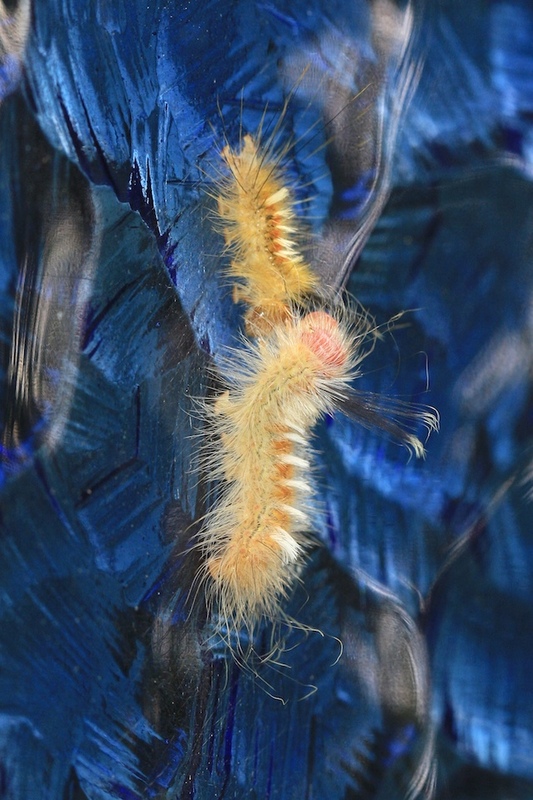 A gallery of older individuals, both caterpillars and adult moths, may be seen here. Temperatures have continued to edge up, but only a degree or two, to 33-34 in the daytime after an overnight ‘low’ (quotation marks for the benefit of those who don’t live in the tropics!) of 24-26C. At least we have been spared the blistering heat of inland and southern Australia’s record-breaking heat-wave. It was one of the top news stories for a week and its link to to climate change was made quite explicit. Even the business community noticed. This time a year ago the Wet had been with us for six or seven weeks and the garden had responded appropriately as per my monthly round-up at the time. This year we are still waiting for real rain (so far we have had 15mm of rain around Christmas Eve and 30mm at New Year but nothing else) and my round-up should be an almost exact copy of what I wrote last month. I’m not going to bother writing it all again, merely note that I have seen my first Elephant Beetles of the season and a few more stray insects including the large moth below. 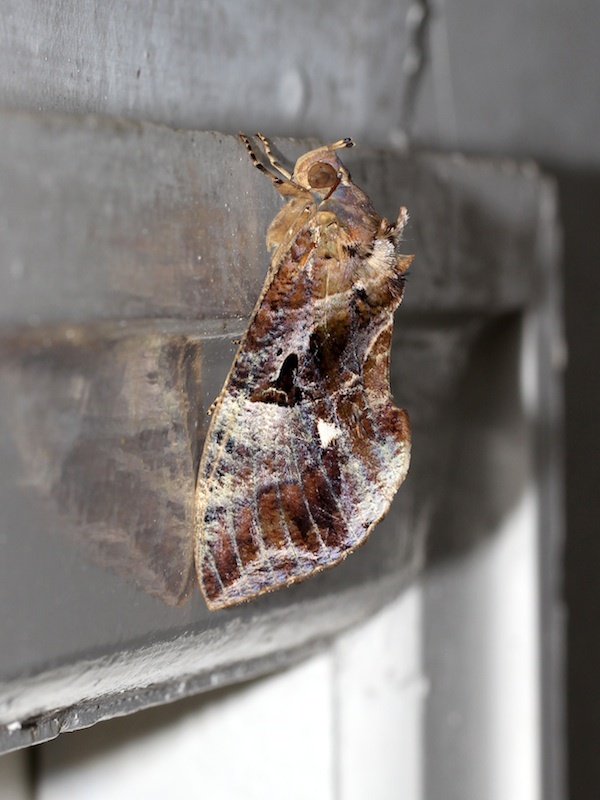 This large moth took refuge on our kitchen window frame last week. Its hind wings are a bright orange but it doesn’t pay to advertise when you’re resting. The biggest event in the garden in the last month has been the flowering of our poplar gum, plus the paperbark, macadamia and bottlebrush. All attracted their quota of nectar-feeders – birds and flying foxes as well as insects. 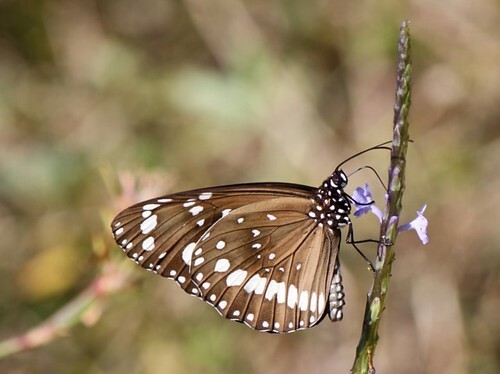 Butterflies and Moths (Lepidoptera): numerous Chocolate Soldiers and Eurema; a few Varied Eggfly and Evening Brown; and visiting Cairns Birdwing, Orchard Swallowtails and Ulysses. Magpie Moths are common again, and I loved the Zodiac Moth on the poplar gum. Nearer ground level, I spotted a pretty white moth, Amerila rubripes. It does have a ‘common name’ – Walker’s Frother – but it’s not well known enough to be a genuinely common name. Flies and their relations (Diptera): Tiger craneflies are abundant, to the extent that I saw half a dozen mating pairs in half an hour one morning, and the orange-headed Plecia flies are also mating. Our tiny metallic Dolichopodidae are as common as ever, and there are a few blowflies too. Mosquitoes? Yes, unfortunately, but not too many. 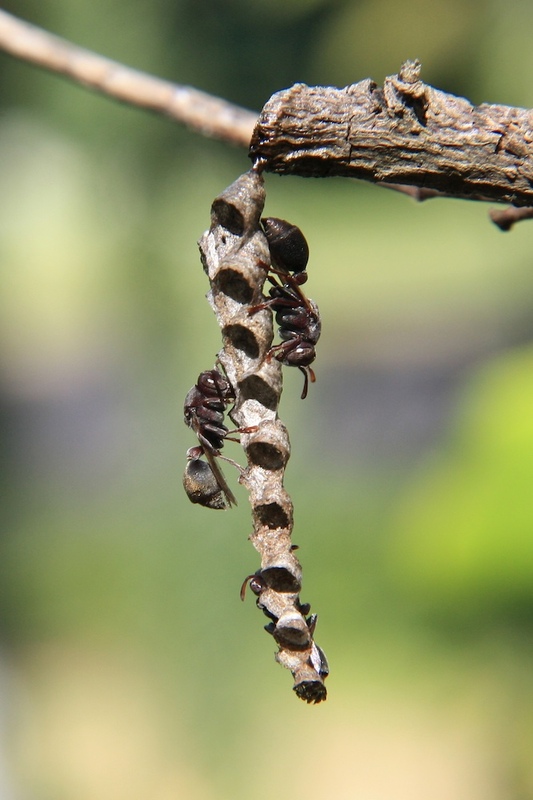 Wasps, Bees and Ants (Hymenoptera): Honey bees came to the flowering trees and various native bees are also around. The small parasitic wasps (Braconidae) are back, and so are paper wasps and mud-daubers. Spiders and other Arachnids: The orb-weavers suffered housekeeping agonies from the poplar gum as flower debris kept falling into their webs, making them useless for trapping prey. Spiny spiders and the Silver Orb-weaver are the commonest at the moment, with a few St Andrew’s Cross spiders for variety. Jumping spiders, Lynx and flower spiders are all to be found, too. Others: A praying mantis was resting on our lounge-room wall last night and I have seen a few dragonflies cruising through our airspace. There very few grasshoppers of any size or variety but lacewings, both green and brown, have been attracted to our lights in the evenings. Of the Hemiptera, my little aqua-legs sap-sucker is back and I have seen a few others; not many, though, and I suspect they are waiting for more new greenery.